this dog wash is a great place to clean up your pets and give them the spa treatment they deserve. There is even an area to relax for your pet under the counter in the padded cabinet. Room Dimensions? - Love your design. Can you share the room and dog shower dimensions? Thank you. The ceiling is 8 1/2 ft.
Big Chill SW 7648 and Ellie Gray SW 7650 are a wonderful combination! We love it! Perfect! I saw this photo at least a year or so back and completely fell in love with the idea! 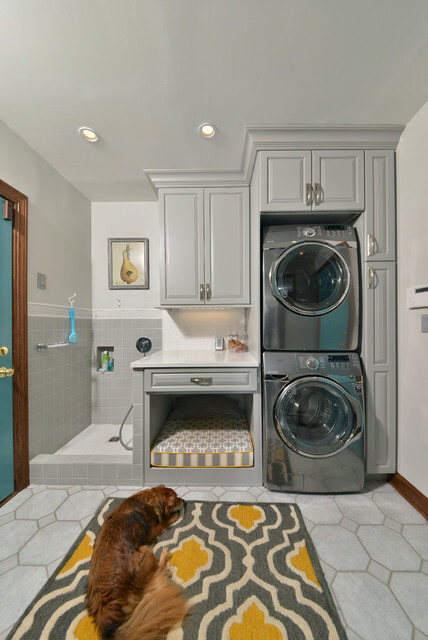 We are now putting plans together for our custom home, and I am definitely putting one in our laundry room. Thanks for answering my question! Love your beautiful laundry room. 9 x 6 feet?? How is that even possible? You mean the entire area? Rug - Can you please tell me rug details? Name and where I could find it. Love it. Thank you! The rug at the At Home store in Toledo, is also from the Brighton collection. The name on the one there is Garden Ridge. It's $249.99. Almost 7x10. It's beautiful. Good luck. That rug is made by a fabulous company. Loloi. And Brighton is a GREAT rug! I am building a small cottage and I am using this photo as a guide to combine the laundry room and powder room, instead of the dog wash! I'll use the counter space as a wash tub where one could also wash their hands, or my two mini longhair Dachshunds! So, I get a dog was to boot!! I'm 5" 4. We had to attach it washer and dryer. my husband built a cabinet above it. Frankly, I can't reach out without a step stool. He's 6" 3 & it's not a problem for him. he wanted to put extra toilet paper, paper towels, etc on it, but we need to get to take too often. We ended up putting our kids party stuff up there, plastic chip bowls, beverage dispenser, etc. it's worked so far. BTW, someone's I have to turn the barrel of the dryer to reach something sick in the back and my kids, 11 & under used to be able to change up laundry, but they can't reach now. pros and cons to everything. How do you reach the controls of the top machine? - The proportions look as though you'd need at least a step stool to reach it. Just curious. I really love this design/concept and am trying to incorporate it into plans to make the rest of the garage area a small apartment for son, but need situate this room in-between two houses. Can I get plans/dimensions for this room? Washer & Dryer - What is the brand name and model if the Washer and Dryer? Great rug! Where did you find it? Access to W/D hookups - Can you tell me how you access the hookups for the W/D, particularly if there's a leak and you need to get to it quickly? Do the W/D pull out together/attached? Is there an access panel somewhere? Thanks for your help and expertise. Where did you put the hookups for this particular project? If you are in Canada, Merit makes cabinets like these in a 9" width. We made the cabinets in our local shop just east of Cleveland Ohio. Washer and dryer - Beautiful renovation! Looking for a stacked washer / dryer combo like this. What is the make & model of this one and what is the cost ? Gorgeous space! - Efficient and practical. 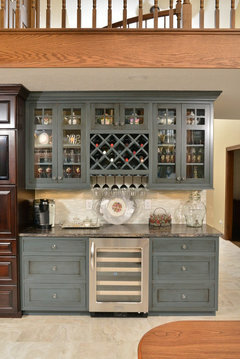 Love the soft grey on cabinets. Would you mind sharing the color? I'm not seeing any blue tones in my cabinets. Maybe it is your lighting. I have LED lights. Where can I buy the rug? 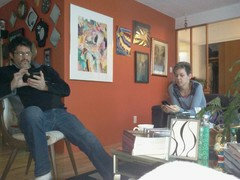 you might try Wayfair.com, Pottery Barn or Ballard Design. Wayfair does carry the rug. It is the Brighton Collection by Loloi. washer machine and dryer - I really love the idea of the dryer on the washer. How the two machines are connected on each other? The client is average height and can reach it with no problem. The manufacture makes these units to be stacked. The homeowner thought this layout to the smallest detail. Do you have more like this one? Thank you do you have mud rooms section? How the heck... - How are you supposed to program the top appliance? Like any other vertically challenged adult-stepstool or climb! Been doing it for 50 years!!! Appliances - What is make and model of stackable washer and dryers please? I love this mud room . I also would like to know make and model of washer and Dryer. like the colors to. They are? Cabinets around washer/dryer - Can you tell me the dimensions of this space? How wide of a space do you need and what is the depth? The opening is 28" wide with a depth of 33". It is 78" tall. great use of the space! Rug - Where did you get it? I bought it at Home Goods. You can probably find it on an online rug site. The name of the rug is "Brighton". I purchased this same rug from wayfair.com. What is the paint color of the cabinets in the laundry room? Has anyone had success with painting Sherwin Williams Koi Pond in their home? Is that the color of the cabinets? dimensions - Hi. dog shower dimensions, if possible? Cabinets - Are these custom cabinets or can they be purchased for a similar layout with alterations? 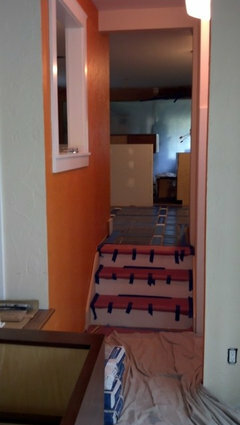 What color paint did you use for cabinets? The space is 281/2" W, 33"D and 77" H.
Great, functional room for pets! - I love the rug. Can you tell me where to purchase? I bought the rug at HomeGoods. Sorry , I don't know the manufacturer. Wow very nice for pet. Love it. From where can I buy this?? Love area rug and dog bed (fabric)! Please, where is it from? Where did you get the dog bed? is it Custom made or store bought? - We actually have just completed a display in our showroom here in Buffalo that is very comparable to this look and we were looking for the perfect dog bed to compliments the gray cabinets and we love what you have done here. Was this bed purchased from a pet supply store or did you have someone make this specifically for your display?? The dog bed was custom-made by J'Adore Custom Pet Beds. You can order any size online and they have a wide variety of fabrics. Can you please tell me where you got the floor tile? Floor tiles - Floor tiles are cool. Manufacturer, color? Sorry. These tiles are no longer available. We kept our original tile flooring when we had the renovations done to our kitchen and laundry room. I tried to find a similar tile, but couldn't find a match. Cabinet color?? - Love this room. What is the cabinet color? Sherwin-Williams : Ellie Gray. Thanks! Floors - What type of flooring was used please? The floor is ceramic tile. It is the original flooring and no longer available. washer and dryer - how tall are the stackables? just seems to tall to reach the buttons. The dryer drum is around 54" and the controls are at 74". This works nicely for me since I'm 5'8". Someone shorter might have a harder time reaching the controls. The dryer is much easier for me to access than the lower washing machine. The stacked washer and dryer is a convenient arrangement for us, but it might not work for someone who would have difficulty reaching the controls. Cabinet color - Paint brand and name/number. Beautiful gray! The inside dimension is 30" x 30" with a height of 22". The bed was made by J'Adore Custom Pet Beds. They have lots of fabric choices. Good luck with your new home. Brighton Collection by Loloi. You can find it at Wayfair. Dog wash - Do you know the dimensions of the dog wash area? Thanks in advance! The inside dimension is 32"x 32". Laundry room - Does this have a sink and additional counter space? The only thing that's not pictured. hi - the dog wash doubles as the sink - you can use it to fill buckets and wash off mops - wash boots etc the white counter to the right is lots of space to use. Door handle - Why is there a gold door handle with brushed nickel cabinet hardware? That was the owner's original door and hardware - as in any remodel our agreement with the owner is to do the work they would like completed and some items may not be included in the scope of work due to any number of reasons beyond the re modelers control, because as we at Artistic Renovations feel the home owner is the boss. Floor tiles - Where did you find this flooring? 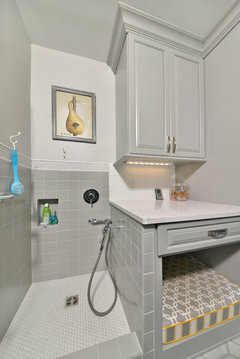 What is the name and color for the tile? This is the original tile for the home. It is no longer available. The dog bed was made by J'Adore Custom Pet Beds. Lots of great fabrics to chose from and the covers zip off and can be thrown in the washer and dryer. Cabinets around washer dryer and dog bed - I live in Idaho... Are the cabinets some that I can purchase somewhere or did you build them yourself? we custom built these but NoreCraft [master brands] cabinets make a cabinet close in color - but will not be the same quality as our custom cabinets. I love this laundry room - Can you please tell me the color of the cabinets? Ceiling & Ventilation - How high are the ceilings? Do these cabinets surrounding the washer & Dryer provide adequate ventilation? The ceilings are 8 1/2 ft. The dryer is vented out the back wall. Shower - Is that a doggy shower? I like the tiles, where to find it? They are from Richelieu. You can order them online. Sorry, I don't remember the specific name of the handles. Carpet - Where did you get that rug? Rear access - if your washer or dryer breaks , how to have access to the pipes back ? They pull out for servicing. do you also make cuboards for children to sleep in? - my son is 7. Hi - We can make built in cabinets for beds or free standing furniture. We can do any custom items that you can dream of. Cabinets on right of W/D - Are those pull out cabinets to the right of the W/D? Wow wide are the cabinets, I was hoping to do something like this on the side of a stacked W/D. I have about 12 inches to the sink cabinet. Washer - Is the washer and dryer stackable, or did you just put them that way? If so, is there anything between them and does it affect how they work? Love this idea!!! Floor - What is the name and color of tile? Thanks! This is the original tile. It is a gray marbled tile from Italy. The tile is 24 years old and I couldn't find a match for it. Sorry. owner - You have the money... I will make the most of your dime.. time is money.... I dont waste yours so be sure not to waste mine! Is the flooring one piece linoleum or tile? Who is the manufacturer? I would like to use this photo in a blog I'm writing. - Its about Florida custom home design, I would give you credit for the photo and a link to your site. Love the cabinet colour. - Can you tell me the colour of the cabinets and the colour on the walls, please. 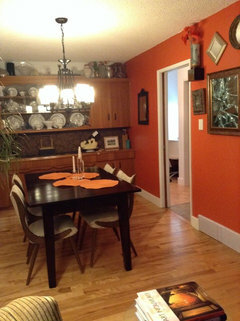 Wall Paint Color - Please let me know what is the color of the cabinets and the wall paint color. Your time is greatly appreciated. Thank you. 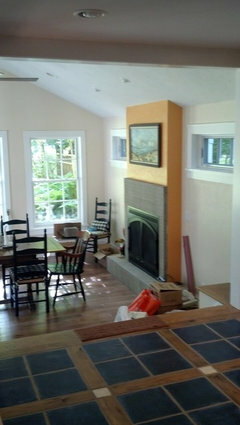 Wall color - What's the paint color for the walls in this room? Thanks! What is the width of the room? Cabinets - What color are the cabinets ? Price - How much did this project cost? How in the world did you hook up and plug in washer and dryer? - We just remodeled and are having to buy a 10' dryer cord and longer washer hoses to get ours hooked up. Dog? - Does it come with the doggie? Dimensions - What are the dimensions of the dog nook? dryer and washer machine - will the dryer and washer machine affect each other when they work? is there any board between them? Room at a GlanceWhat happens here: The room acts as a laundry, mudroom and dog washing area.Location: Akron, OhioSize: 50 square feet (4½ square meters)Tip: In a room with heavy traffic where the door is usually open to another room, as with this one, use similar colors and finishes in both so that the two rooms read as one.In the new room, the washer and dryer, which had been side by side, are stacked, which freed up room for a dog shower. “The shower is designed to do almost everything a utility sink can do, but it can also be used to wash dogs,” Perrin says.The shower and the bed are the territory of Roxy (pictured) and Bella. 2. Think thin. The slimmest of cabinets can usually fit your long-handled cleaning tools, and this one tucks in right next to the stackable washer and dryer. 5. Gray and white plus yellow. Who doesn’t love the cheery note of yellow juxtaposed against the cool of gray and white? As a bonus, the neutral backdrop provides numerous options for different accent colors in the future; accessories solidify whatever palette you choose. The pear art and yellow on the dog bed (in the open cabinet) repeat the yellow of the rug. 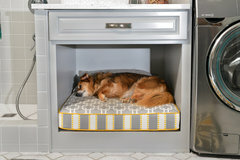 The dog bed fabric picks up the gray and white of the cabinetry, backsplash and flooring. Wash area for dog and dog bed area. Lower level for dog shower + utility washing?